Two of my favorite blogs to follow are Pixie's Crafty Workshop and Mrs. A's Butterfly Challenge. When I can make one card that fit the criteria for both I am extremely happy! Today....I am extremely happy! But before I share that happiness, I want to say thank you to everyone who has been commenting on and joining my blog. Yesterday a young lady named Jean joined as a follower. What makes me so pleased is Jean said she wished she could follow me via email. Thank you Jean for pushing me into trying to figure out how...And guess what, I can't believe how easy it was. I'm from the generation of don't push buttons you don't know what could happen. Well, this button made me very happy and my machine did not blow up! (giggling here). So again, Thank You Jean! Snippets again, The butterflies were just from borders that I kept. Not enough paper to do much more than punch butterflies. These butterflies were punched using the Martha Stewart punch with the 3 butterflies. The piece behind the sentiment wasn't big enough of course I realized this after I'd glued it down...so, the left side was a piece of trim I'd saved from another project. Not perfect gluing, but pretty close. There is sequins here too. Thanks JayDetaylor for being in the right place at the right time and having a camera! Well, that's it for me today. I'm going to try to get a card done for Rudolph Day....If that's going to happen, I'd best get my act together. 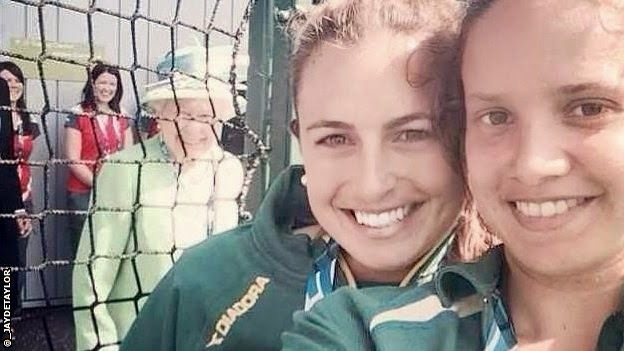 Wasn't that photo bomb just brilliant :) Our Queen does have a wicked sense of humour which not everyone is aware of. Really love the colours you've used, and the inside of this card is just as nice as the front. Running round in circles here. Thought I had already left a comment so good thing I checked back. This card is absolutely thee bees knees. Love the colours and of course the Graphic 45 papers. I do so like the way you decorate the insides as well. Gorgeous combination of stripes and spots. Thankyou for fluttering by challenge. hugs Mrs A. (butterfly challenge). I love the colour your have used, and the fab design paper.